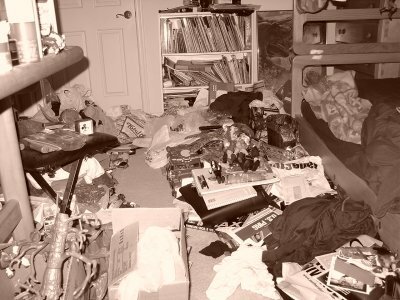 That is what my room looked like in June 2004. By November of that year, it looked like this. So you can just imagine what it looks like now. Or at least how it did look before I spent almost twelve hours last night -- I started at 10:30 PM and didn't sleep until around 10 AM this morning -- burrowing through the mess in an attempt to restore it to some semblance of order. Now, I didn't take any pics of what the room looked like before I started, but several hours into the cleaning process, this is what the room looked like. Note the captions. In the course of rummaging through the clutter, I actually came across three boxes with cereal still in them, all of which had been expired for at least a year. Pictured here is a box of Winter Fruity Pebbles -- which, given its expiration date, must have been there since the previous winter season. Nice. Also, the reference to the bed frame calls attention to one of my modes of travel. Given that the floor was often too cluttered to serve as a suitable path, I used to grip the frame of the top bunk with my hands and strafe along the side until reaching an acceptable dismount spot. I'm actually going to miss doing that! It was kinda fun and made me feel like only the most nimble of secret agents could navigate my lair of mystery. In addition to the cereal, I also discovered a box of Chicken Flavored Snack Crackers. Now, like all of the expired foodstuffs I found in the room, I had actually intended to review these for Scary-Crayon before I lost track of and completely forgot about them. They weren't all that great even when they were fresh, so I can't imagine what they taste like now. (Rest assured that we'll find out soon enough on SC.) Also, the Turtles' Battle Shell and a bottle of rum! Granted, I knew exactly where these things were (along with the bottles of bourbon, sloegin, and vermouth...), but still. Speaking of bottles, I removed upwards of forty empty bottles from my computer area. You can't see this in any of the pictures, but that has immensely contributed to the presentation of the room. Also, outside the door at the top of the photo, note the large bags of trash. And nearly twelve hours after I began, this is what the room looked like. Now, I know what you're thinking. "It looks almost exactly the same!" 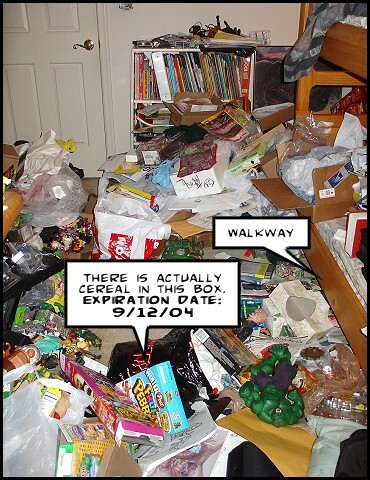 To which I respond, "Dude, I haven't seen that much of the floor in YEARS!" Seriously, I could lie down there now, if I wanted to. Which I have wanted to do, because I actually used to sleep on the floor. Preferred it to my bed, even. But I digress. While the room isn't perfect -- as you can see, that right corner, which I didn't much mess with this time, is going to require a lot of attention in the future (to say nothing of the closet of horrors), and the action figures on the left side of the room are pretty much here to stay -- it is nonetheless a substantial improvement over its previous arrangement. And remember, there are a number of changes that you can't see. Previously, that enclosure -- and the area of this photograph, even -- was filled with empty foodstuff boxes. 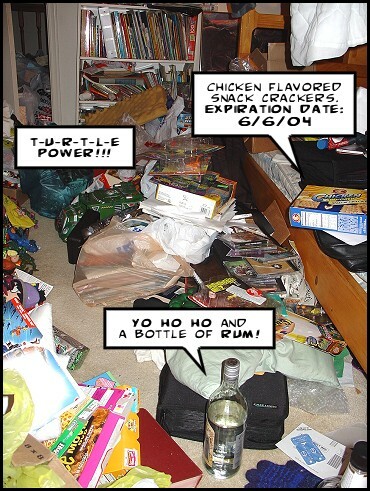 Cereal boxes, Hot Pocket boxes, Bun Meal boxes, granola bar boxes, Little Debbie snack cake boxes, Boca boxes, Garden Burger boxes, breaded calamari boxes -- basically, almost everything I've consumed since summer 2003 that came in a box has been documented over there. Now, I wasn't just being messy -- I was deliberately saving the boxes for something -- but even with my practice of placing smaller boxes inside larger boxes, they rook up a substantial amount of space. Therefore, in addition to tossing some, I flattened them all, shoved them in two single, larger cardboard boxes, and relocated them to my basement stash. I also did this with a number of books (god, I must own at least a thousand books) in order to bring the room to its present state. Crazy walkway. Err.. floor space. Good job! I will never yell at Emily for leaving the milk ring on the counter ever again. Job well done! 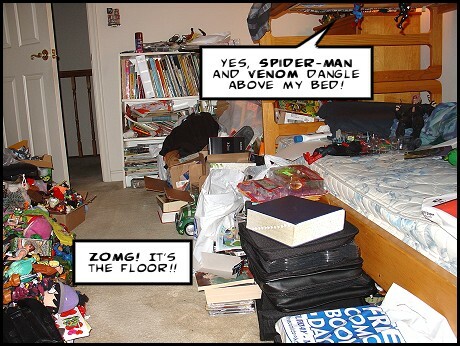 I would cry if my room was in your condition. Dude. I think it was when I saw one of those older pictures of your room that your simiarity to one of my ex-boyfriends hit me. Great job on the cleanup! Nasty Wes. Just plain nasty. 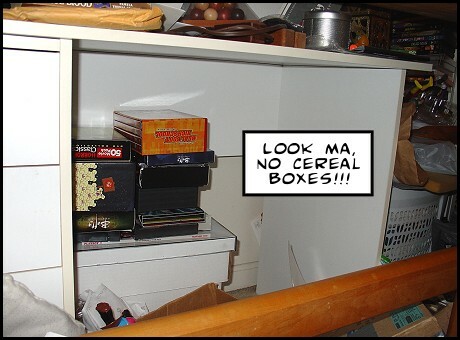 If you lived in Hawaii, you wouldl've had ants all over your room, trying to get to that cereal. It was in the bags inside the boxes! What, do Hawaiian ants have heightened senses of smell? Are they mutant ants? Given that normal ants can carry up to 20 times their body weight, I'm not sure I want to mess with those things! Perhaps having that cereal around would come in handy, because ants that tough may require stale cereal to pacify them. Dude, you shoudl sell tickets. "Wes' House of Horrors". safe to assume you don't bring girls back to your place too often? I've never taken a girl back to my place.